Chance doesn’t deal happiness with an even hand — some lives are more weighed down by sorrow than others. It can be easy, and misguided, to romanticize suffering — despite Elizabeth Barrett Browning’s superb admonition against it, we have a long cultural history of perpetuating the “tortured genius” myth, the reality behind which is far more complex. What would it mean, instead, to orient ourselves toward sorrow neither with indulgence nor with self-pity, to regard it not as a malignancy of life but as part of its elemental richness? That is what Vincent van Gogh (March 30, 1853–July 29, 1890) addressed in a remarkable letter to his brother Theo, found in Ever Yours: The Essential Letters(public library) — the treasure trove that gave us Van Gogh on talking vs. doing and how inspired mistakes move us forward. Van Gogh had set out on this particular walk in order to clear his head and his heart after finally splitting up with Sien — the alcoholic prostitute with whom he had fallen in love a year and a half earlier, just after recovering from the heartbreak that taught him how to turn unrequited love into fuel for art. It was a deeply ambivalent breakup — Van Gogh recognized that they couldn’t make each other happy in the long run, but he was deeply attached to Sien and her children, as was she to him. 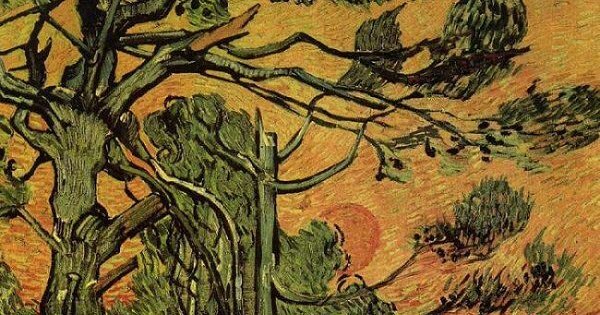 Seeking to quiet his mind, Van Gogh headed out “to talk to nature for a while.” From this turbulent inner state, he witnessed a violent storm which, paradoxically, reconciled him to his sorrow and helped him rediscover in it the elemental beauty of life. You know the landscape there, superb trees full of majesty and serenity beside green, dreadful, toy-box summer-houses, and every absurdity the lumbering imagination of Hollanders with private incomes can come up with in the way of flower-beds, arbours, verandas. Most of the houses very ugly, but some old and elegant. Well, at that moment, high above the meadows as endless as the desert, came one driven mass of cloud after the other, and the wind first struck the row of country houses with their trees on the opposite side of the waterway, where the black cinder road runs. Those trees, they were superb, there was a drama in each figureI’m tempted to say, but I mean in each tree. Then, the whole was almost finer than those windblown trees seen on their own, because the moment was such that even those absurd summer houses took on a singular character, rain-soaked and dishevelled. In it I saw an image of how even a person of absurd forms and conventions, or another full of eccentricity and caprice, can become a dramatic figure of special character if he’s gripped by true sorrow, moved by a calamity. It made me think for a moment of society today, how as it founders it now often appears like a large, sombre silhouette viewed against the light of reform. Yes, for me the drama of a storm in nature, the drama of sorrow in life, is the best… Oh, there must be a little bit of air, a little bit of happiness, but chiefly to let the form be felt, to make the lines of the silhouette speak. But let the whole be sombre. Seven years later, the drama of sorrow disfigured the silhouette of Van Gogh’s life. Complement this fragment of Van Gogh’s deeply alive Essential Letters with French philosopher Simone Weil — one of the most luminous and underappreciated minds of the twentieth century — on how to make use of our suffering and Tchaikovsky on depression and finding beauty amid the wreckage of the soul, then revisit Nicole Krauss’s beautiful letter to Van Gogh across space and time about fear, courage, and how to break our destructive patterns.